Hi Everyone, thanks for reading this post. We have just spent great 2 weeks meeting up with very good friends and together cruising down the St Lawrence Seaway and out into the Gulf and then on to New England. It is a journey we have been looking forward to for some time and the places visited and the scenery were terrific. It is our 15th year cruising with our four good friends and as always there is lots to talk about and to enjoy, both on and off the cruise ship. 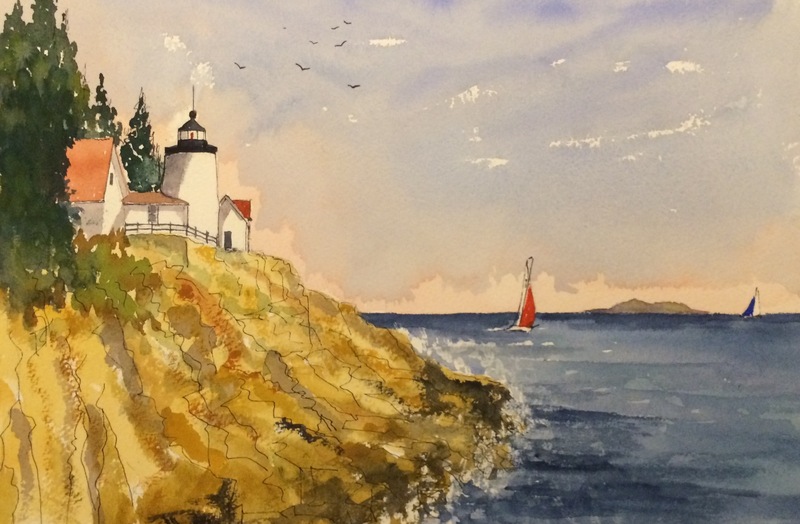 Naturally it is great opportunity for photography, and for me, a time to paint some watercolours of the places we have visited on the Cruise, and afterwards in a short stay in Kennebunkport in Maine. This year the vivid autumn colours are little later than usual but we did still manage to catch some views of the trees turning to gold, bronze, and red as we travelled. Vainly we watched for whales which do frequent this region, but alas 3 spouts was the only glimpse we got, and a potential whale watching trip in Bar Harbor was sabotaged by bad weather. Anyway I have lots of photos to turn into watercolours but here are the paintings that I managed to complete on the cruise. More updates to this blog in the future as I sift through the photos and turn some into watercolours. 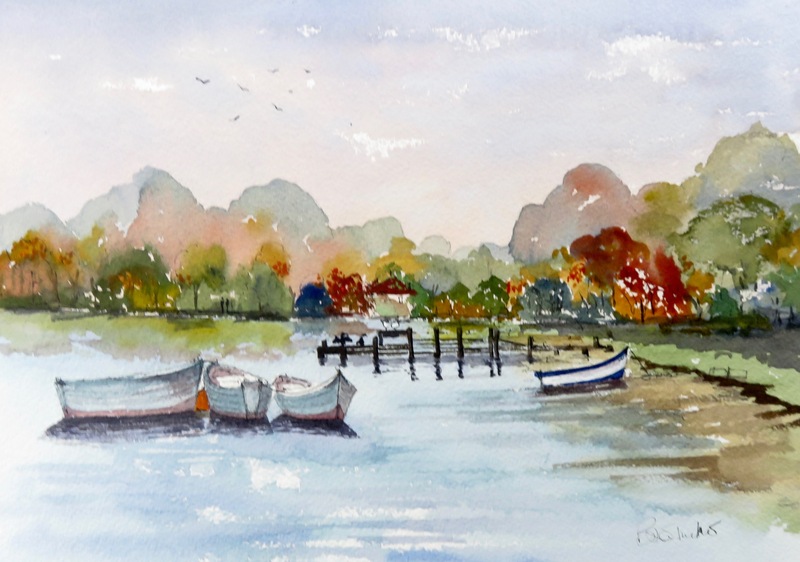 I have included a couple of extra paintings from previous trips to New England for you to see until I can get round to some new watercolours of New England. 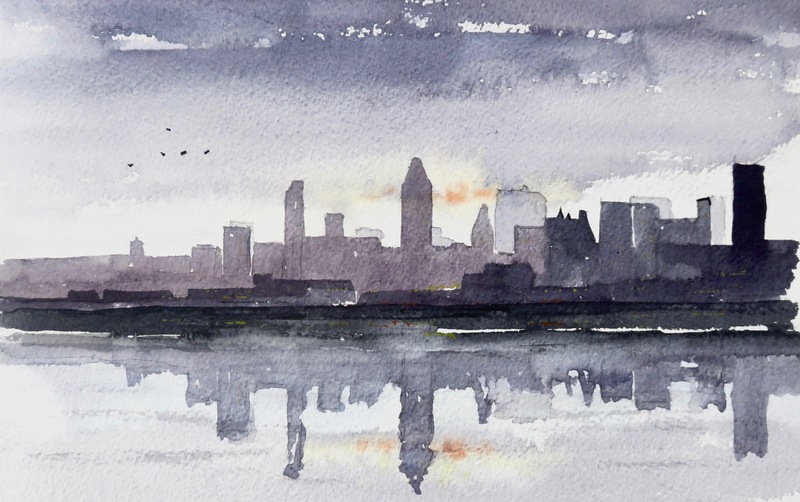 We started the cruise in Montreal and this evening skyline painting didn’t work too well but it gives glimpse of this interesting and large city. Montreal is I am told the second largest French speaking City in the world, second only to Paris! 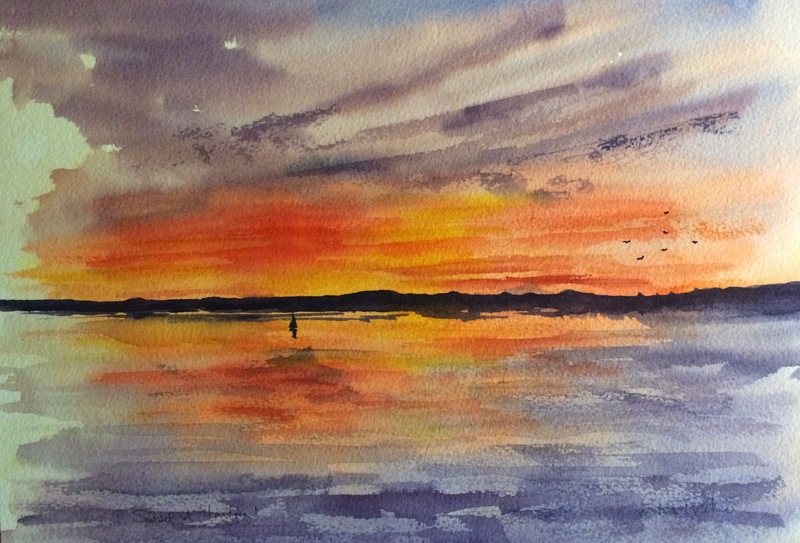 On leaving Montreal we were treated to a spectacular sunset which gave me an interesting challenge as a watercolour. Overnight we sailed to Quebec where even though it was our second visit there we enjoyed walking around this lovely City. On our second day we took a “Foodie Tour”, which was really good. Local food and wine and stops many tasting places and restaurant finished up by beer and Cheese tasting in the Frontenac Hotel. Our guide was excellent and the combination of Food and history of the City was very interesting. I strongly recommend this if you are planning some time in Quebec. Have look at http://www.toursvoirquebec.com, our guide was Jocelyn Belle. 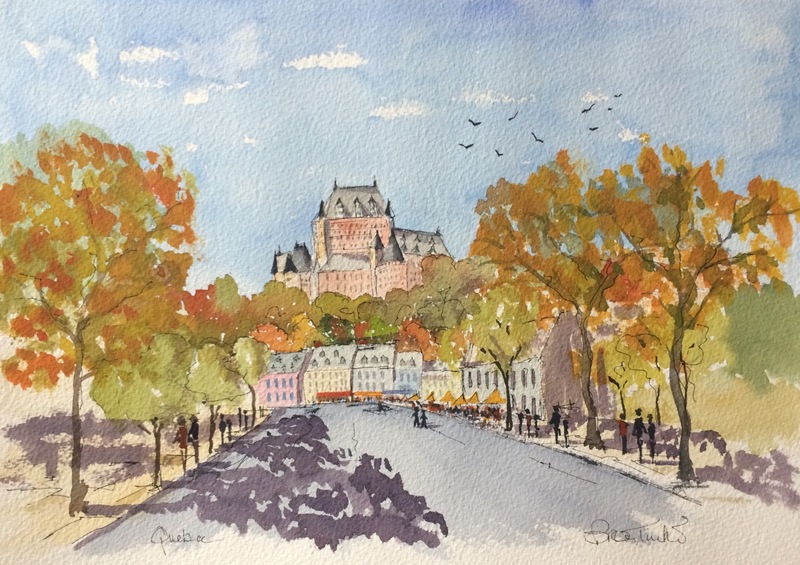 On the tour the view of the Frontenac Hotel from the older and beautifully restored lower town inspired this watercolour. Our next port of call was Saguenay, a town at the end of a 32 mile Canadian Fjiord. Despite watching for whales at the entrance to the fjord we didn’t manage any sightings. From Saguenay we sailed over night to Baie Commeau, a small but interesting town on the North bank of the St Lawrence. A highlight there was our time spent at the Glacier visitor centre with amazing information about, and photos of Glaciers around the World. From here we went on to Gaspe where we took to opportunity to visit Perce and its famous Rock. This vast rocky island lies just offshore and dominates the town. 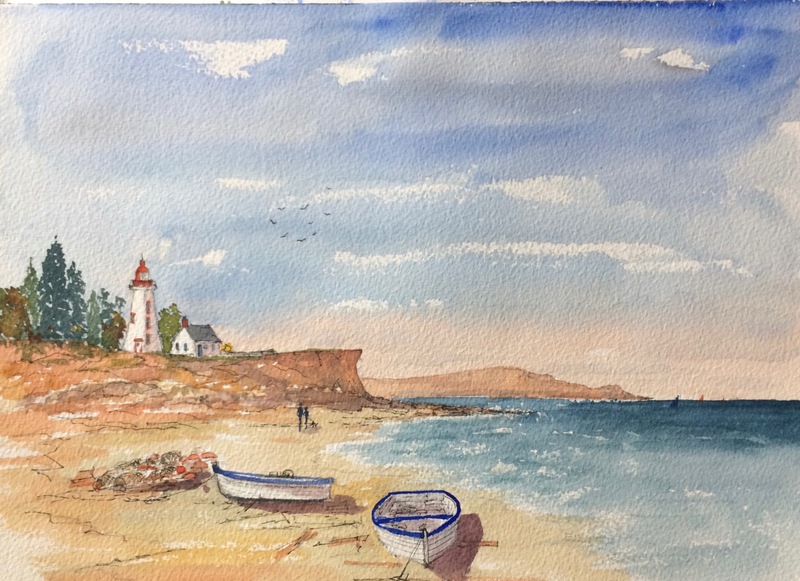 Here is my painting from a photo taken just out of the town at the lighthouse. Pierce Rock. Watercolour 14 inches by 10. From Gaspe we sailed to Prince Edward Island , but alas due to strong winds we were unable to dock there. 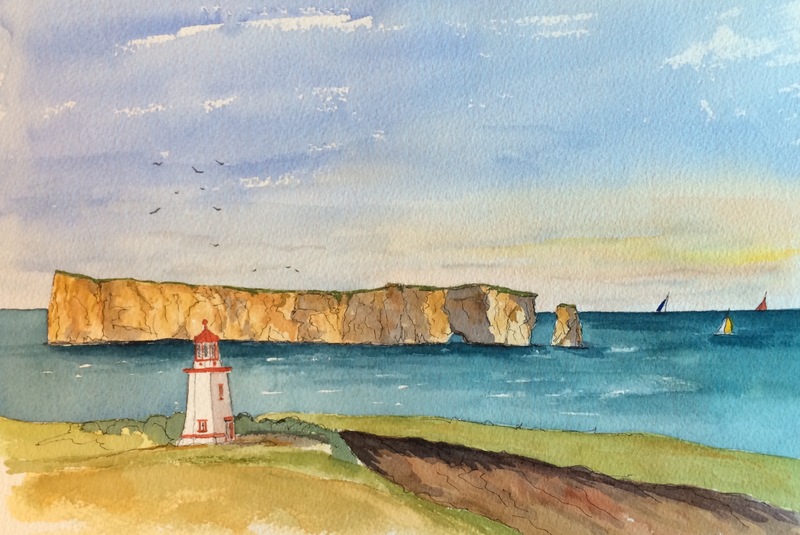 However these two lighthouses passed by the ship as we sailed and approached the island and so on the extra day at sea I painted these two watercolours. A Lighthouse near Gaspe in Canada. Watercolour 14 inches by 10. Blockhouse road Lighthouse on Prince Edward Island. Watercolour 14 inches by 10. After the dissapointmetnof not landing at Prince Edward Island we sailed on for 2 days to Halifax, Nova Scotia. They have made the board walk a real feature of Halifax and it is very pleasant stroll along it into the town and up to the Citadel if you have the energy for the climb! There are some lovely old yachts and small ships in the port at Halifax and fine views across to Fort George. 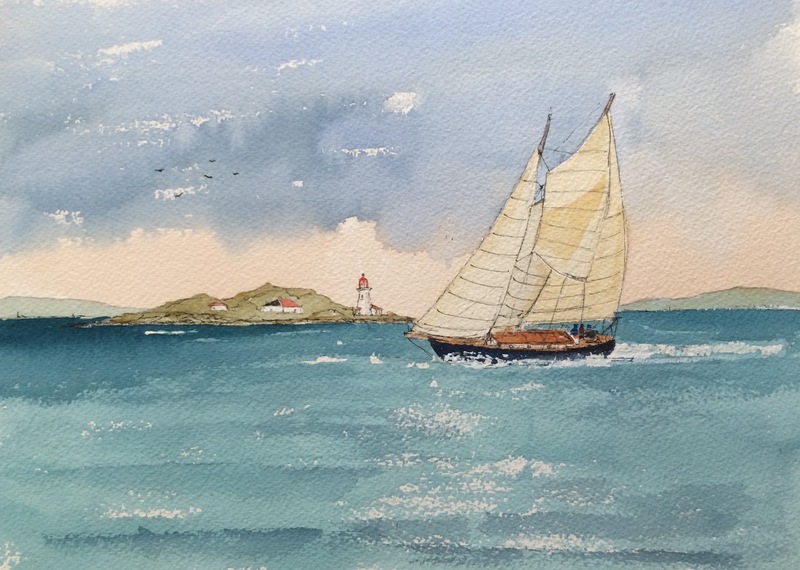 Here is a painting of vintage yacht sailing past Fort George, just a little bit of artistic licence here to bring them together at the island! From Halifax we sailed overnight to Bar Harbor. Bar Harbor is lovely town with nice shops, and galleries, as well as being on the beautiful Mount Desert Island. Alas, it was pouring and windy when we were there, but luckily we had been there is good weather some years ago so we could imagine it in the sun. Our plan of a whale watching trip was impossible in such rough weather too. 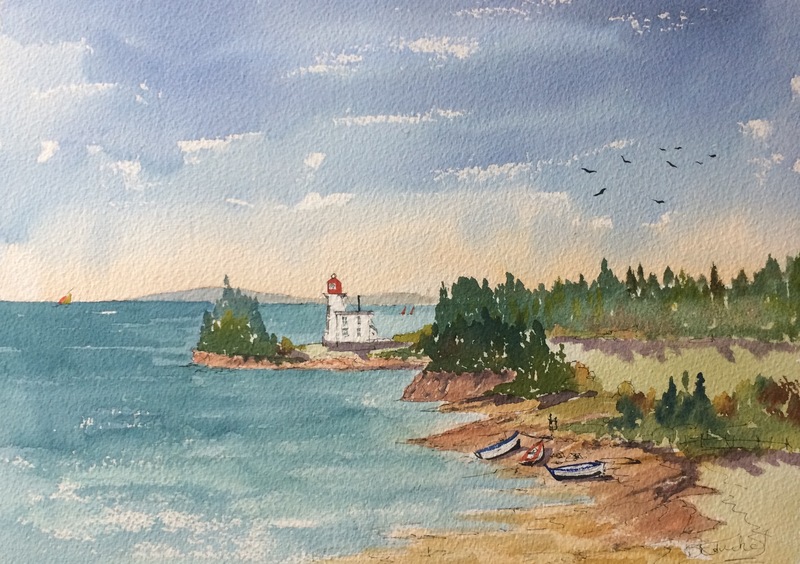 Thus my painting of the Mount Desert Lighthouse is from an archive photo and is on sunny day! Lighthouse on Mount Desert Island near Bar Harbor. It was really rough weather leaving Bar Harbor and the night to Boston was the roughest cruise night we have encountered, not bad after so many cruises, we have been lucky! We didn’t stop in Boston but picked up a car and drove with our friends to Kennebunkport where we stayed in the very nice “Captain Lord Mansion”. We really like Kennebunkport and the whole area. In the centre of the town by the bridge you can see these 3 Dories slowly swinging together with the tide. Thought they made good subject for a watercolour. “The Three Dories” at Kennebunkport. We took a trip the next day to Ogunquit and Perkins Cove and the Nubble light house near York. 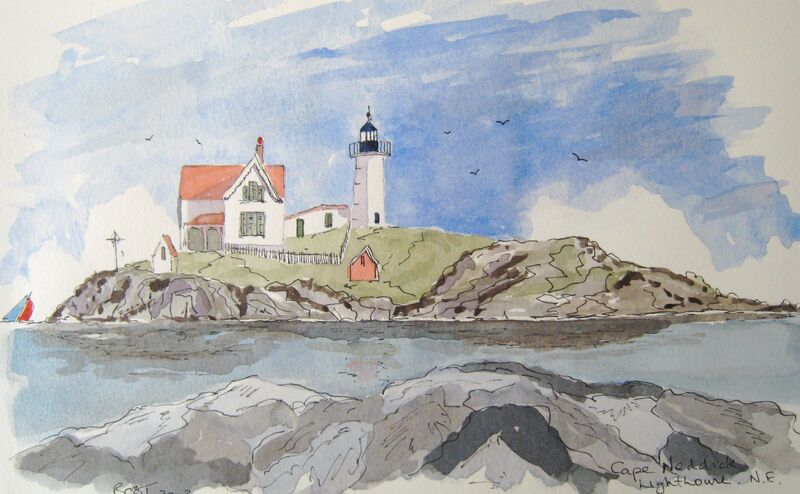 I have many more paintings of New England to do now but here is one I did 10 years ago of The Nubble which will do until I can paint a few new ones. So from Kennebunkport it was back home, farewells to our friends till next time and a flight back to the UK. A great holiday with such good friends, lots of food, wine and great times.